It therefore stands to reason that if you are considering something as important as love, the zodiac is worth a look. Firstly, it can help you find out what other singles you are likely to be compatible with, and secondly it can explain some interesting things about your own character and personality before you get started. Where do I begin when discovering my astrology dating compatibility with other singles? 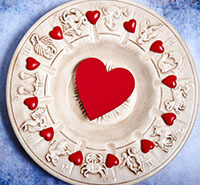 If you are a newcomer to Astrology and dating, it is worth completing a Natal Chart, which you can easily find online. With more thorough information than just your birth date, such as the exact location and time of birth you will receive more detailed analysis of your character which can help you discover hidden facets of your personality, and your astrology dating compatibility in general. The Astrology Library argues that this detailed chart is far more helpful than considering yourself simply a stereotype of one of 12 zodiac signs. "The celestial configuration that took place at your moment of birth is a powerful indicator of your motivations, drives, preferences, and psychological makeup.” Think of your chart data like a fingerprint, which only belongs to you. It can be hard for a person to see themselves accurately, and both positive and negative traits can be difficult to accept when you are looking in the mirror. With online dating, the person you are speaking to has only your own profile to go by, and that’s written by you! The better you can understand your own personality and character traits, the more likely to meet someone compatible. How can I use the zodiac to find a match when online dating? With over 40 million people in the US trying out online dating, the pool of singles can be too large to navigate. For seniors looking for love, it can be frustrating to wade through unsuitable matches or the many less than serious contenders. Many mainstream websites are therefore beginning to make astrological search terms or dating tips available to their members, to better help them on the path to love. If the website you are browsing has a magazine or a blog, make sure to search the archives for articles on Astrology. This is especially useful on a matchmaking website, such as eHarmony. Where you have filled in a detailed profile, this information could be used to help you with an online astrological forecast, better matching you with like-minded members of the site. Other websites have included direct functionality to search using star signs and other astrological terms. OurTime is a great choice for Senior dating, with a wide range of members, and allows you to use the advanced search to look for exact zodiac signs. In order to better use this functionality, you will need to be aware of which zodiac signs are compatible with one another. There is a vast amount of information online to help you understand the ways in which the stars help different signs relate to one another. You can use this information to estimate the kind of online relationships which will work for you. For example, a Leo is more likely to be passionate and jump in quickly, looking for commitment from you. If you are looking to start something casual, they may not be the best choice. Sagittarius by contrast value their space and freedom. Gemini partners are known to get bored easily, which may result in a seemingly serious interest which then fades quickly. All of these can be used in tandem with an advanced search to narrow down your journey towards love. Interested in using Astrology dating sites to find love online? Try the search features on OurTime Senior Dating to get started.